After terrorizing desktop computers for years, the gamer-centric branding is now making its way to mobile. 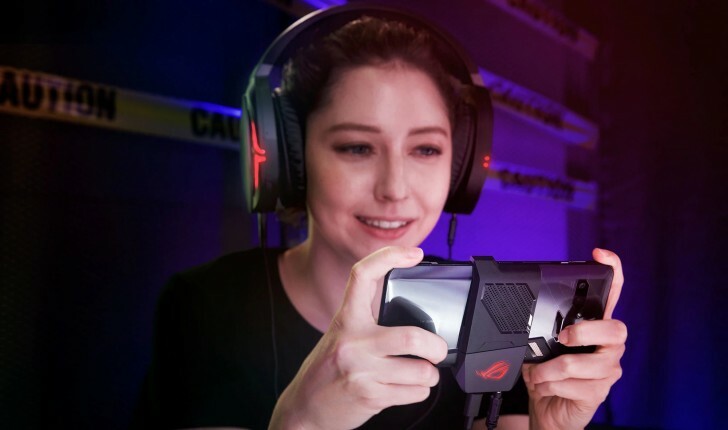 Following Razer's footsteps, ASUS has announced the ROG Phone, it's first "gaming phone". It may be a phone noone aske for but it sure looks different than anything else we've seen. 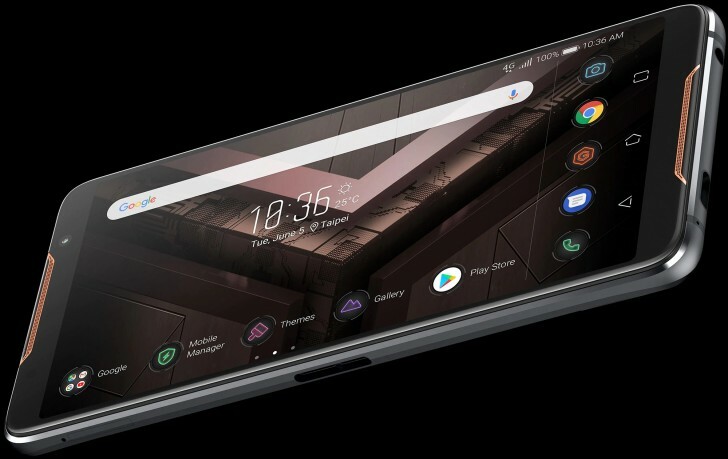 For what it's worth, ASUS has gone many more steps ahead of Razer to really sell you this phone. Starting with the phone itself, it features the gamery aesthetic that plagues every gaming-centric computer out there. The front is all glass with cutouts at the top and bottom for a pair of stereo speakers. On the back is what looks like cooling vents with a dual camera system and a sideways ASUS ROG logo. The logo features RGB illumination (because why not?) and can be programmed to display any color in different patterns and also use as a notification light. The back is also covered in Corning Gorilla Glass, just like the front. The phone is also water-resistant although no official rating is provided. Apart from having a USB-C port and a headphone jack at the bottom, the phone also has an accessory port on the left in the center. The side port can be used for charging while gaming so the cable doesn't interfere with your hand. The headphone jack supports 24-bit/192Khz Hi-Res Audio playback and DTS Headphone:X. The phone has three ultrasonic pressure sensitive zones. One is on the side like on HTC phones, which can be squeezed to activate the "X MODE", which optimizes performance by shutting down background tasks and turning the theme red. It also activates the fan on the optional AeroActive Cooler accessory, which also includes a USB-C port and a headphone jack that comes out the left side of the phone so they don't interfere with your hands on the bottom edge. The other two are on the two corners in landscape mode. These are called "AirTrigger" and work as virtual trigger buttons in games. You can map them to any function within the game as long as it is supported. Internally, the phone packs a special, binned version of the Qualcomm Snapdragon 845, which clocks up to 2.96GHz instead of the usual 2.8GHz. It is paired with 8GB of RAM and a choice of either 128GB or 512GB of storage. A "GameCool" vapor-chamber is included to pull the heat away from the chipset and distribute it along the phone. The phone also includes 802.11ad Wi-Fi, which is still quite rare. The battery is a sizable 4000mAh with ASUS "HyperCharge" 20W fast charging. The display is likely the star attraction. It's a 6-inch, 18:9 AMOLED panel with a resolution of 2160x1080. Most importantly, the panel refreshes at 90Hz and has a response time of 1ms. ASUS also claims HDR support and 108.6% DCI-P3 coverage. The accessory support is quite extensive. Apart from the aforementioned AeroActive Cooler, there is the Gamevice controller, which attaches to either side of the phone. It includes a WiGig Dock for streaming the game on to a big screen over the fast 802.11ad connection. There's also a dock for connecting the phone to accessories like a keyboard, mouse and monitor. Lastly, there is the TwinView Dock, which has a clamshell design. The phone goes into the top part and the bottom part has a second 6-inch, 1080p display. The accessory also has its own 6000mAh battery. The price hasn't been announced yet but the device will go on sale some time in the third quarter. Now, there's no doubt the phone is impressively specced, even if you don't plan on playing any game. However, the whole gamer aesthetic and silly brandings are as kitsch as they get. Secondly, the gaming scene on Android isn't exactly exploding, with most of the games on the store being of the casual kind that won't benefit from the various controller accessories in anyway. The more challenging titles are few and far between and also don't need a powerhouse device to run. Most of the titles also don't run above 60Hz as we saw with the Razer Phone, so the 90Hz refresh rate will only really be useful while navigating the phone's menus. Lastly, it's likely none of this is going to be cheap, so the whole value proposition is already out the window. And having a whole ecosystem of accessories around one phone has never really worked well. There is no guarantee these will be compatible with future ASUS ROG phones or if there even will be any future ROG phones. So to expect people to drop a considerable amount of money on these with no guarantee for the future seems a bit much. So, yeah, A for effort. Just not sure if it was necessary.